Vietnam’s capital city, Hanoi, lies in the North of the country. It’s one of Vietnam’s most popular destinations amongst tourists, owing to its beautiful lakes, ornate temples, and delicious street food. Hanoi has fairly strict laws when it comes to nightlife, so most clubs and bars close around midnight; however, there’s still plenty to do in the city after dark. The Old Quarter, the city’s busiest area, for example, has lots of thriving pubs in which you can enjoy a bia hoi (traditional Vietnamese beer) and is home to a range of street food vendors. If you’re in the district in the morning, be sure to try a traditional egg coffee at its birthplace, Giang Café. Another must-see evening spot is the Lotte Tower Observation Deck. 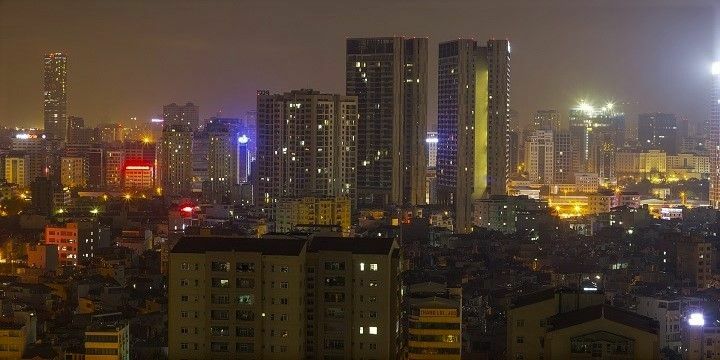 Hanoi is great at night. Take one of the high-speed elevators to the 65th floor (253m) for amazing views over Hanoi’s beautiful lights. If you’re still awake after a bia hoi, or wake up particularly early, head to one of Hanoi’s late night/early morning markets. Long Bien Market, for example, is open from 1:00 to 6:00 every day. It’s one of the best places in the city to buy fresh fruit and vegetables, and is busiest at 3:00, when locals arrive to fill up their trucks and motorbikes. Alternatively, check out Quang Ba Flower Market, which is open between 2:00 and 6:00 every morning, and sells an array of flowers, including orchids, roses, and sunflowers. Hanoi has a whole host of temples for visitors to enjoy. Perhaps the most notable is the Bach Ma Temple, which is the oldest in Hanoi. Established by King Ly Thai To in the ninth century, Bach Ma was originally built on the Long Do Mountain, but was moved to its current location in Hanoi’s Old Quarter in the 18th century. Another must-see is the Temple of Literature, which is featured on the back of a 100,000 Vietnamese Dong banknote. 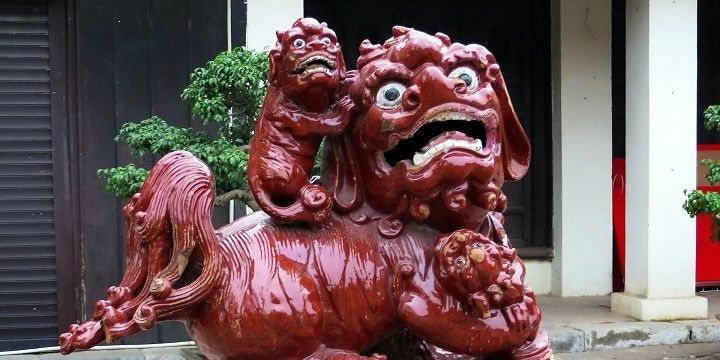 Founded by Emperor Ly Thanh Tong in 1070, this was the site of Vietnam’s first university. Students still visit today to pray for good grades, and enjoy its beautiful pagodas, ponds, and gardens. The Temple of Literature is featured on the back of a 100,000 Vietnamese Dong banknote. To learn about Vietnam’s rich history, be sure to check out the Hoa La Prison, where both Vietnamese and US prisoners were kept during the Vietnam War. Only the southern part of the prison remains today, as most of it was destroyed in the 1990s to make room for the Hanoi Towers hotel and office complex. 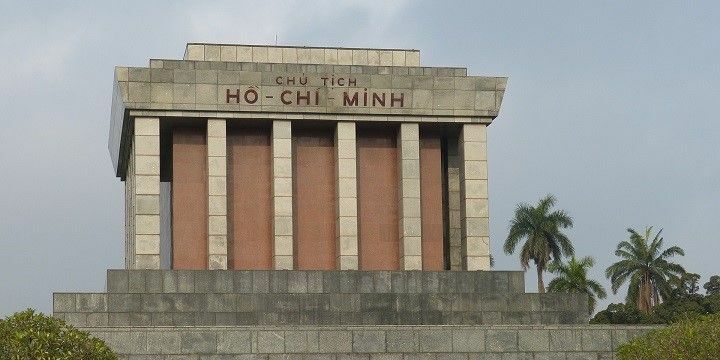 The Ho Chi Minh Mausoleum is actually located in Hanoi. For some more joyous history, head to the Ho Chi Minh Mausoleum. Despite the confusing name, this landmark is actually located in Hanoi’s Ba Dinh Square. This mausoleum is the final resting place of Vietnamese revolutionary, Ho Chi Minh, and is where he read the Declaration of Independence in 1945. As this is a particularly important site for many Vietnamese locals, it's strictly forbidden to take phones and other personal objects inside the mausoleum, or wear short skirts, or sleeveless T-shirts. If you want to escape the hustle and bustle of the city, head to Hoan Kiem Lake. Try to get there around 6:00 to see the locals practicing traditional t’ai chi on the shore. Sites of interest around the lake include the bright red Huc Bridge, the secluded Ben Ngoc Son temple, and the ornate Ly Quoc Su pagoda. 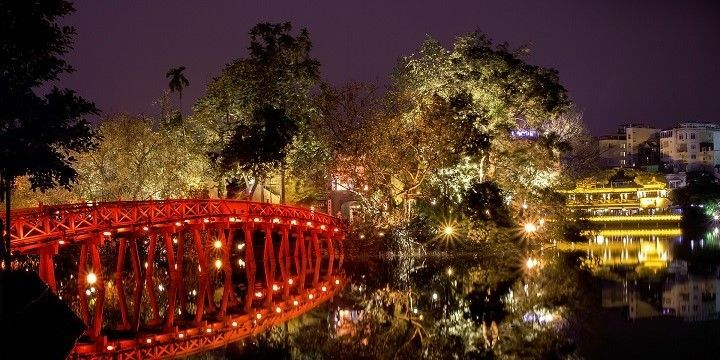 The red Huc Bridge is a must-see at Hoan Kiem Lake. Another of Hanoi’s stunning lakes, West Lake, is located just a 15-minute drive from the city’s Old Quarter. At five square kilometers, this is Hanoi’s largest freshwater lake, and is a great spot for joggers and walkers, as well as those who simply want to enjoy a drink in the area’s many cafés, bars, and restaurants. If NextStop24 helped you to choose your next travel destination, we'd be very grateful if you’d search for your accommodation and things to do in Hanoi through these links. They're affiliate links, which means that we will receive a small commission for every booking made through them. There are no extra costs for you; you'll simply be helping to keep NextStop24 running. Thanks!